What: Relive all your favorite moments from the 1983 film—leg lamps, Red Ryder BB guns, and “don’t shoot your eye out!”—in this touring Broadway musical. What: Is your high-schooler reading Romeo & Juliet? Give him a glimpse of one of the world’s rarest books—the first-ever collected edition of Shakespeare’s plays. What: A little bit funny, a little bit spooky, and plenty heartwarming, nothing says Christmas like the story of Ebenezer Scrooge. Bring the family for the annual Alliance Theatre production of the Charles Dickens holiday tale, now in its 27th year. What: For years, families have trekked to the historic Candler mansion to see it decorated for the holidays. Now, a new tradition begins with the addition of an evening Christmas-themed outdoor light display, which includes a singing forest and a kids-only area where snow will fall. Bring your letters to Santa (you can mail them here) and an appetite (treats will be available along the way). What: This Center for Puppetry Arts holiday tradition features all your favorite characters from the classic Rankin/Bass television special. Attendees can also make their own Abominable Snow Monster puppets. For ages 4 and up. What: Priscilla makes her annual porcine debut under the big tent outside of Macy’s Lenox Square. Hop aboard the more than 50-year-old train, then head inside the mall for pics with Santa. Cost: Free with admission ($18 for adults; $16 for kids 3 to 12; free for kids 2 and under). IMAX movies require additional ticket purchase. What: Fifteen years ago, the permanent “Giants of the Mesozoic” exhibit opened at Fernbank, featuring fossil casts of the world’s largest meat-eating and plant-eating dinosaurs. Now, in a new temporary exhibition, you’ll have a chance to examine life-sized bones, muscles, and internal organs of the biggest dinos that ever lived. Marvel at the size of their teeth, how much they ate, and the force of their heartbeats, and hit the IMAX theater for a showing of Dinosaurs Alive! When: 5 p.m. to 10 p.m.
What: See the Botanical Garden in a whole new way when it gets bedazzled with millions of twinkling holiday lights. New this year: The Walk of Flames, featuring 21 oversized candles. What: Eight million lights spread across 15 scenes make this one of the region’s top holiday displays. Hop out of your car and aboard the open-air Jolly Trolley for an extra-festive viewing. What: The natural history museum gets decked out with more than 30 trees, each representing the holiday traditions of a different culture or country. While you’re there, check out the Holly Jolly Film Festival (11/19-12/17), featuring holiday classics like A Charlie Brown Christmas and other cultural performances. What: Learn about three periods of American history—the first Thanksgiving, the Civil War, and life on the 19th century prairie—in the 2,000-square-foot interactive exhibition, based on (and created by the minds behind) the Magic Tree House children’s book series. Among the hands-on experiences: climb inside a horse-drawn Civil War-era ambulance; crawl into a storm cellar and imagine what it was like to survive a tornado in the 1800s; or set the Thanksgiving table for the first feast. What: Make it a white Christmas at Stone Mountain’s annual winter wonderland, with tons of trucked-in snow for sledding, tubing, and snowman making. Work up an appetite for warm drinks and roasted marshmallows. What: Acrobats and aerialists perform eye-popping stunts as a live orchestra plays holiday tunes in this touring circus-themed event. What: What do you get when you combine tap dancers, a seven-piece band, beatboxers, and beloved holiday characters like the Grinch or the kids from Peanuts? This show, brought to you by the percussive dance and musical troupe Rhythmic Circus, who also created the musical Feet Don’t Fail Me Now! What: Bring your Frozen-phile (and your earmuffs) to this open-air staging of the Hans Christian Anderson tale that inspired the Disney film. What: This year’s annual concert, “Comfort and Joy,” will feature a mix of traditional and contemporary holiday music, and (if tradition holds) an ice cream social afterward. 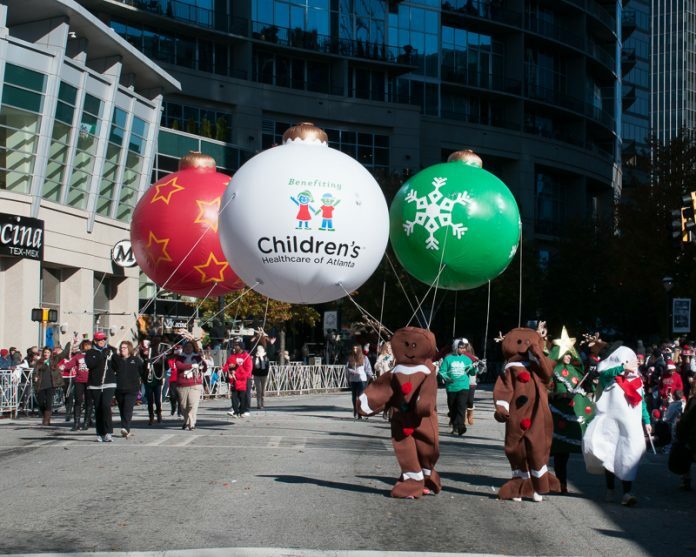 What: Watch as festive floats, helium-filled balloons, and marching bands make their way down Peachtree Street at the Southeast’s largest holiday parade. Arrive early to nab a prime viewing spot, or purchase bleacher seats for $20 a pop. What: Today is the one day of the year that pups can set paw inside the Botanical Garden, so dress Buddy in his holiday finery and get ready to compete in the costume contest—or just pose for pics with Santa. What: The centerpiece of this annual holiday tradition is the guided tour of some of Oakland’s most beautiful mausoleums. But there will also be caroling, an artist’s market, hot cocoa, live music, a reading of The Night Before Christmas, and a visit from St. Nick. What: This month-long series at the Children’s Museum of Atlanta celebrates four different holiday traditions—Las Posadas (12/3-9), Hannukah (12/10-16), Christmas (12/17-24), and Kwanzaa (12/26-30)—with storytelling, special performances, crafts, and more. What: Enjoy the holiday adventures of “twelve little girls in two straight lines” at this 1-hour play, for kids ages 3 and up. What: See talented metro area kids, ages 6 to 18, perform on stage in this show benefitting Children’s Healthcare of Atlanta. When: 2 p.m. to 3:30 p.m.
What: Pinkies up! Sip tea and hot cocoa, nibble on dainty sandwiches and desserts, and snuggle your favorite bear at this annual event. Santa will make a special appearance, and admission to tour the decorated mansion is included in the price. What: Since 1993, the Moscow Ballet has performed the Great Russian Nutcracker, set to the classic Tchaikovsky score, in cities across the U.S. When: 2 p.m. (Saturday only), 8 p.m.
What: Watch Peter and the Darling children fly to Neverland as Atlanta Lyric Theatre stages the Tony-winning Broadway musical. What: This family-friendly holiday staple will feature traditional holiday music performed by the Atlanta Symphony Orchestra, the ASO Chorus, the Gwinnett Young Singers, and the Morehouse Glee Club. What: See the combined choirs perform a program that includes an audience sing-along of traditional holiday carols, accompanied by the Hall’s pipe organ. When: 5:30 p.m. to 9:30 p.m.
What: Stroll through the candlelit gardens and grounds of the History Center, which will host a Christmas craft market, and special crafts and programs to show you what the holidays were like way back when. The Smith Family Farm takes you back to 1864, while the Swan Coach House plays home to a jazz-age Christmas, and the Wood Family Cabin hosts a pioneer Christmas circa 1821. What: Atlanta Ballet dancers pirouette across the stage in this annual tradition, choreographed by longtime artistic director John McFall, who retired last year. What: Kids ages 3 and up can enjoy this play based on the 1938 children’s book about a house painter who befriends a family of penguins. Bonus: You can wear your jammies and enjoy milk and cookies during Friday evening performances. What: See the south portion of Centennial Park, including the Southern Company Amphitheatre, decked out with 25 colorful lanterns, an enormous pagoda, and a 200-foot-long Chinese dragon—all handmade by artisans in China. Each night will also feature acrobats, dancers, artisan demonstrations, and more. What: Pet real live reindeer, get your face painted, roast marshmallows, and hike the trails at this sixth annual holiday event. What: The full Atlanta Symphony Orchestra, the All-City High School Chorus, and special guest vocalists will be on hand for this annual holiday concert. Audiences may even receive a visit from Santa and his reindeer. Cost: $25 per person ($20 for members). Advance registration required. What: Part of the aquarium’s annual Festival of the SEAson, this event includes a full breakfast, plus kids can participate in holiday crafts and spend quality time with St. Nick. What: This live touring show reenacts magical moments—like when Cinderella’s Fairy Godmother her rags into a beautiful gown—from Disney films. What: The theater organ at the Fox—dubbed “The Mighty Mo”—is the second largest in the world, and this annual free concert shows off its full wall-shuddering power. In addition to the music and holiday sing-along, there will also be a screening of The Santa Clause. What: What is it with circus-themed holiday concerts? The hot trend continues with this returning show, featuring acrobats, aerialists, contortionists, jugglers, and strongmen, who will each do their thing as the Atlanta Symphony Orchestra and Miss America Betty Cantrell perform holiday favorites. What: Ring in 2017 with a dance party, bubble-wrap “fireworks,” and two countdowns at noon and 4 p.m. When: 9 a.m. to 12:30 p.m.
What: Celebrate the New Year with a live DJ, bubbles on the terrace, games, and a balloon drop at noon.